If you want a one stop shop where you will be able to make all your bill payment then you can try Mobikwik. 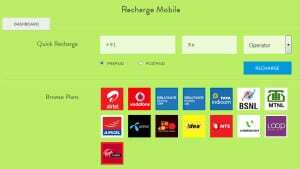 It is an online payment gateway which helps the users to recharge their mobile or Data Card, and DTH too. In case you are using a postpaid plan of any mobile service provider, then also you will be able to make the payment of your bill right away through Mobikwik. Apart from mobile bill, you will also be able to pay the landline bill, electricity bill, gas bill as well as the Life Insurance Policy payment can also be done through this website. You must be wondering why you need Mobikwik when your service providers have their own website to help you with the payment of bills. If you are using the website of your service providers, then it is bit complicated because of the options that are available there. But if you are using Mobikwik, then the whole process of recharging becomes quite a simple affair. Mobikwik online recharge will provide you all the options of services that it provides. You have to click on one of the link and it will take you directly to the payment option. In that very page you will get all the detailed information about the various plans and when you have selected the plan, then you can also select the mode of payment that is possible through debit cards, credit cards, net banking and most interestingly if you want you can also opt for the option of cash collection right from your doorstep. It provides you the payment option for your life insurance policy as well. The names of the Life Insurance policies who accept payment through Mobikwik are Birla Life Insurance, ICICI Prudential Life Insurance, India First Life Insurance and TATA AIG Life Insurance policy. Apart from life Insurance, you can also avail the Airtel online recharge too. Though these options are quite lucrative, but the best part is the Mobikwik wallet where you can store money to make use of it later. You can add money in there so that you can pay your bill using that amount. To top it all, you can also call in to recharge your phone or even send SMS as long as your wallet has sufficient balance. This is best suited when you are in a place where you do not have access to the internet but need an instant recharge. Now with the local cable connections, making a huge fuss over the broadcasting of different channels, many DTH service providers have come up with their affordable plans. 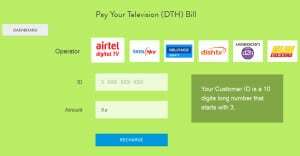 Through Mobikwik you will be able to do DTH recharge online and that too for services like Airtel, Tata Sky, Videocon and Sun Direct. In case you have raised any trouble ticket, then you will be able to track it too. You just have to click on that very option and you will be provided with the details. You must make use of Mobikwik to ease out all your payment options and enjoy the bill paying process. Previous: Why Should You Consider Premium Domain Names?